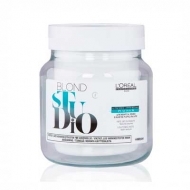 DESCRIPTION: Blond Studio Platinium Plus from LOréal Professionnel is a bleaching paste with up to 7 levels of lightening for a uniform, golden and shiny result. Ideal for open air techniques and silverware. This paste has been enriched with nutricerides and beeswax to soften and soften the hair fibber and promotes hydration and nutrition. Maintains lipid levels on hair surface for deep revitalization. 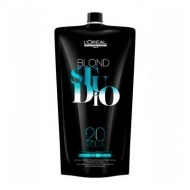 Contains potassium persulfate for quick lighting and a purer laurel. In their technology, two complementary texture polymers are further blended to provide a creamy and pleasing texture which facilitates mixing and stable illumination.